Make your fortune... by mastering your disguises! 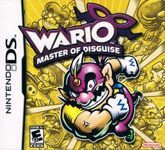 Sketch a disguise to change Wario! Use the power of the disguise to explore, attack, and hunt for treasure!